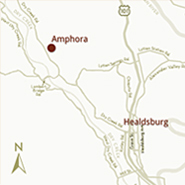 We're located at 4791 Dry Creek Road, Healdsburg, CA approximately 1.5 miles north of the intersection (STOP sign) of Dry Creek Road & Lambert Bridge Road. That is about 6 miles north of the Dry Creek Road exit from Hwy. 101 in Healdsburg. From the south: Exit northbound US Hwy. 101 in Healdsburg at the Dry Creek Road exit. Turn left onto Dry Creek Road, proceed approximately 6 miles to 4791 Dry Creek Road (on your right). From the north: Exit southbound US Hwy. 101 at Canyon Road, make a right turn onto Canyon Road, proceed approximately 2 miles to Dry Creek Road. Turn left onto Dry Creek Road. Drive south approximately 2 miles to 4791 Dry Creek Road (on your left). You can find a link to a map here.